I finally have some of my voice back! It still hurts to talk and swallow, but I think I'm on the road to recovery. Just to help my immune system along, I've been increasing the amount of garlic I put in my food all week. Today I think I went a little bit crazy. I added about six large cloves of garlic to my pasta. Now, I eat so much garlic that I don't even notice it if I have it on my breath but today, I could taste the garlic even after washing lunch down with a cup of tea. I had to gargle with Listerine to feel satisfied I was safe to go to work. I stayed home from work today. It was such a relief that the weather was much cooler. I spent most of the day in bed, but got outside for some fresh air to water the plants. I planted a few new seedlings of garlic chives and rocket that I bought from Bunnings on Sunday. I've been saying to myself that I will work on the garden when the weather is cooler, so I thought my half hour outside was me keeping true to my word. Feeling a surge of renewed strength, I spent a few hours outside slowly removing the dead plants. Don't want to overwork myself because I am sick, but the fresh air was really good for me. I noticed my Thai basil is doing really well, so while I was clearing the dead debris, I tried to think how I could incorporate them into dinner. There's always my favourite, Thai basil chicken, but I wanted to try something new. I decided to make chicken skewers. First, I washed and roughly cut up some potatoes and tossed them in some olive oil and two cloves of crushed garlic. I arranged them in one half of a baking dish and put them into the oven to begin cooking while I prepared the chicken. In a mortar, I ground some pinenuts, chilli flakes, and crushed garlic. I chopped up the Thai basil and added this to the mortar as well as some olive oil. This mixture will be the chicken marinade. I diced some chicken thighs and rubbed the marinade all over before skewering them. I cut the skewers to make them short enough to fit in the other side of the baking dish that I had kept empty. By now, the potatoes had been in the oven for half an hour and were browning rather nicely. I put the chicken skewers in with them and in another twenty minutes, they were all ready. I put together a quick salad of mixed lettuce leaves, whole baby beetroots from a can, and some basil fetta I found in the fridge. I kept some aside to take to work tomorrow, but Jocelyn saw it and asked if she could eat it. She let out the most annoyed and disgusted moan while staring at her plate feeling grossed out. She was probably thinking 'how can I eat any of this now that that yucky stuff has touched the rest of my food!?' - HAHA! After a few seconds, she realised I was joking. Or was I? I cooked some pasta intending to take half of it to work tomorrow for my dinner, but I was so hungry, I ate it all! I was supposed to stay home from work today and go see the doctor, but I think I passed my bug onto another girl at work and so reluctantly, I agreed to work her night shift tonight. At least I could see the GP After Hours doctor and get the consult bulk billed. My throat feels like I've swallowed a handful of pins and I've lost my voice, so there was only one thing to do. That's right, I made three soups. The mushroom soup didn't turn out too well because I added a bit too much buttermilk so it developed a bit of a sour/nutty taste when i reheated the soup later to eat. Usually I use cream or milk, but I was trying to use up the buttermilk! It was very quiet at work tonight. I couldn't talk - I had to whisper and even then my throat felt like it was on fire. Before leaving for work, I left some pork mince in the fridge and a note for my mum to make me some wantans so I could have them when I got home. I stayed over at Marissa's last night since we have plans to have lunch at a work colleague's place out in the hills. Teresa made a fruit salad to bring. The drive to Sue's house took us about an hour. Had we known there was a shorter route, we probably would have only taken about half an hour! Sue's house is absolutely beautiful - set amongst the bush up in the hills. It looks like it's straight out of one of those style magazines for homes. Lunch looked fabulous! Sue certainly laid out a huge spread for us. The French doors open out to create such an open atmosphere to the house. It was the perfect Sunday lunch - the weather was warm but I love being out in the hills - love the outdoors. When we could eat no more, we sat outside under the patio and watched Sue's kids in the pool. I never noticed at the time, but there was actually not a fly in sight! The bush provided a beautiful setting for me to have a play with my camera and take lots of photos of Sue's son running back and forth in his magician's costume. I tried to be discrete because I love natural, spontaneous photos rather than ones where people are posing. As soon as Wes saw me with the camera, he'd always smile and strike a pose. He's so photogenic. The photo below has got to be my favourite. The drive home via Tonkin Highway was much shorter than the drive there. The heat of the afternoon was almost unbearable in the car though. Still, had a really good day. This weekend has been great - lots of eating! Yes, that is one of my catch phrases hee hee! We've been looking forward to tonight for several months now. 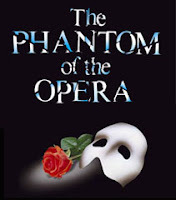 Marissa, Teresa, a few of their friends and myself bought tickets to see Phantom of the Opera at the Burswood Theatre. We all met up at Marissa's place and then drove to Burswood for the matinee show at 2pm. Although I've seen the show on Broadway while I was in New York n 2006, it was just as thrilling and beautiful to see it again this time in Perth. I especially love the scene where the phantom brings Christine into his secret lair across the river. The stage floor is covered in a layer of mist, large candelabras lit with candles, the phantom and Christine gliding across the 'river' in a little boat. The set is eerily romantic. I've been listening to the soundtrack for the past few weeks to psyche myself up for the show. I bought the CDs while I was in New York but only just opened it for the first time now. I couldn't resist swaying my head to some of the songs and shedding a few tears. Ooooh, I just love the theatre!! for a drink and nibblies. We also ordered a serve of Turkish bread with dips but I was too busy eating to remember to take a photo. The food was rather ordinary. The serves were much too small to be worth the cost though. We had a reservation for 8:30pm. We were all hungry though, so went to see if there had been any cancellations so that we could eat earlier. Encouraged by the ladies, I told the floor manager at the desk that I had a reservation for 6:30pm. He looked up my name on the computer and said he had me down for 8:30pm. I replied that when I phoned up earlier to change the booking from six people to five people, the reservation had been recorded for ten people (which was true). Immediately, he shook his head and muttered that the booking receptionists were always making mistakes and he organised a table for us. Yay! We felt bad for lying at first, but there were many empty tables around us while we had dinner so that alleviated our guilt. I couldn't resist taking a photo of this newly renovated restroom near the gift shops in the hotel lobby. I love the design of the sinks. After dinner, we went to the casino to use our coupons for complimentary drinks and $10 on the gaming tables. Teresa suddenly wasn't feeling well so we went to one of the new bars to sit down for drinks. Mesh Bar - the place is starting to resemble Melbourne's casino. I really liked this new bar. Lots of cute guys. I had Smirnoff's Green Apple vodka for the first time - DELICIOUS! After escaping from a creepy guy who seemed to be following us from the bar to the carpark, we went back to Marissa's place for some tea and sweets. Sylvana and Filomena (I hope I spelt their names right) had brought some macarooms from Baby Cakes. What an absolutely fantastic night. We had such a great time. I haven't laughed that much for a while. Ginger Nuts. I woke up barely able to speak today. As soon as the chemist above the lab opened, I was up there buying Soothers. When I got home, I had a power nap for ten minutes before dragging myself up and keeping my social plans for the evening. Amazing what those cold and flu tablets can do! We used my wasabi and ginger dressing as a dipping sauce for the prawns. We spent the night singing karaoke. Needless to say, with my sore throat, I was not at my peak performance tonight, but we all had a really fun night together. I managed to drag myself out of bed to get ready for work today despite my throat being so sore. Before heading off, I went outside to water my plants. I was met with the lovely sight of a zucchini flower in bloom. I have to say, it was rather quiet at work without my usual chatty self. I couldn't wait to go home. I had half a fennel bulb left in the fridge so used it in this delicious salad. I used orange, fennel, red onion, avocado and mixed lettuce. Not wanting to mask the flavours of the orange and fennel, I just drizzled some olive oil over the salad instead of making a dressing. After dinner, I made some stuffed baby eggplants to take to Noel and Fleurette's place tomorrow night. Halve baby eggplants and scoop out some flesh with a spoon. Lay eggplant halves on a baking tray, drizzle with olive oil and roast in oven until browned and softened. In some olive oil, sautee some chopped onion and crushed garlic until softened. Add some ground cumin and ground coriander and stir for a few minutes. Add chopped eggplant flesh, mushrooms and tomato. Add a splash of water or chicken/vegetable stock and allow mixture to simmer gently. Keep adding a splash of water/stock if it starts to dry out. Fill the eggplant halves with this mixture. I intended to serve these warm with some melted cheese. My throat is so sore!! I didn't sleep well last night. I kept waking every hour feeling feverish and my throat was getting sore. By morning, my throat was like extra coarse sandpaper so I called in sick. I made some honey and lemon tea and by lunch time my throat felt better. As the afternoon wore on, my throat started getting sore again so I made some soup for dinner. I used onion, garlic, leek, celery, carrots and chicken for this deliciously hearty soup with risoni pasta. After dinner, I put together a quick platter and went to Noel and Fleurette's place to watch the next Bond movie.